When first commissioned in 1944, the Mackinaw was the most powerful icebreaker in the world. At the end of her career in 2006, the Mackinaw was still the largest United States Coast Guard Cutter assigned to the Great Lakes and the premium standard for other icebreakers. The Icebreaker Mackinaw, WAGB-83, began as an idea in the mind of United States President Franklin Delano Roosevelt and a gleam in a Coast Guard admiral’s eye. In a speech given on December 29, 1940, President Franklin Delano Roosevelt declared that the United States needed to be “the Arsenal of Democracy,” with factories busily humming all year to produce materials that would help the Great Britain and the other democracies win the win against Nazi Germany. The steel factories along the Great Lakes were essential to the war effort, but these plants needed iron ore which meant keeping the shipping lanes on the Great Lakes open as many months of the year as possible. Normally, the Great Lakes ports remained icebound until the end of April, but the United States government believed that with an effective icebreaker, the ports could be useable the third week in March. The Coast Guard stepped up to build such an effective icebreaker for the Great Lakes and Congress authorized the funds to build the Mackinaw on December 17, 1941, ten days after Pearl Harbor. Coast Guard Rear Admiral Edward H. Thiele had made a research trip to Europe to study Scandinavian icebreaker design as well as the design of the Soviet icebreaker Krassin. The Naval Engineering Branch of the Coast Guard based the Mackinaw’s design on Admiral Thiele’s research and Gibbs & Cox of New York developed their design from the Coast Guard Plans. The “W” or wind class ships has been used to identify all Coast Guard ships since World War II, when in the early years of the war, Wind class icebreakers were designed for icebreaking and combat operations in Arctic waters. A Navy and a Coast Guard ship with the same number on their bows could cause complications, so the Coast Guard painted a “W” in front of the number on their ships. The “AGB” stood for Arctic Glacier Breaker. On March 20, 1943, shipbuilders at the Toledo Shipbuilding Company in Toledo, Ohio laid the Mackinaw’s keel. The Toledo Shipbuilding Company went bankrupt during the building of the Mackinaw and the American Shipbuilding & Dry Dock Company took over Toledo Shipbuilding Company and completed the Mackinaw. On March 4, 1944, the American Shipbuilding & Dry Dock Company launched the ship and christened her Mackinaw. After successfully putting the icebreaker through sea trials on Lake Huron, the Coast Guard commissioned the Mackinaw on December 20, 1944. The Mackinaw was built at a cost of $10,000,000 with special consideration for her life in the fresh water Great Lakes. She had greater breadth and length than the other Wind-Class ships, but her dimensions meant that she was too wide for the Welland Canal. She would never leave the Great Lakes. Her excellent design and construction provided the Mackinaw with a fortified hull. Moving continuously, she could break 2.5 feet of ice and by backing and ramming she could demolish 11 feet of ice at one swipe. The Mackinaw steamed to Cheboygan, Michigan, her designated home port, and the Coast Guard assigned her to ice breaking duties from January 20, 1945 to the end of the war in August 1945. In January 1945, local Sault Ste. Marie papers reported that the Mackinaw had helped open the Soo Locks. After the war ended in the summer of 1945, the Mackinaw performed typical Coast Guard duties during the ice free months, including law enforcement, search and rescue operations, patrolling regattas and supply missions. Usually around the first week in March, the Mackinaw headed for the strategic Straits of Mackinac to begin ice operations and then she worked up through the Soo Locks to White Fish Bay. After that the icebreaker went to the St. Mary’s River and then to the head of Lake Superior. Twenty five Soviet sailors and other naval personnel came aboard the Mackinaw to be trained in ice breaking operations in preparation for the Soviets taking over one of the “Wind” class icebreakers that the United States had given to them under Lend Lease. The Mackinaw served the communities and shipping companies of the Great Lakes for over 60 years, but as the years passed, she grew expensive and difficult to maintain. 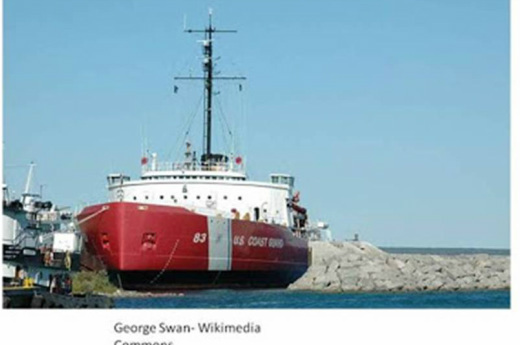 In June 2006, the Coast Guard decommissioned the Mackinaw and she made her last voyage from Cheboygan to Mackinaw City, Michigan to serve as a lakeside maritime museum. The Icebreaker Mackinaw Maritime Museum is located at 131 South Huron Avenue in Mackinaw City, Michigan.